Piece of Candy is a PVP group coordinator. Control the number of players displayed in a "swimlane"
- Don't warn when can't find AbilityId. - Remove debugging "HERE" message. Oops. - Don't ask for a quest while in combat (performance tweak). - Reset keep and resource requests if they are Chalman Keep and Mine. Use /poc to get them back if you want them. - Eliminate the dependency on LibMsgWin-1.0. believe that it was missing quests which caused unnecessary traffic. but always share quests unless quest sharing is turned off. - Warn about two new conflicting addons. - Try harder to hide UI as soon as we leave group. - Reorganize and hopefully streamline column updates. - Follow the new trend of requiring libraries to be installed rather than bundling them with this addon. 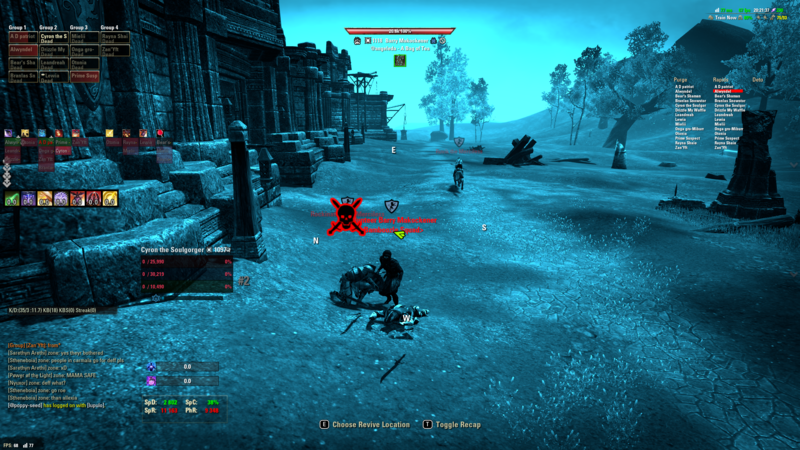 - Limit map pings to potentially avoid ESO kick. - Fix issue with errant MIA when first joining a group. - Add option (on by default) to only show populated ultimate columns. - Always show ultimate number if that option is selected. Show as grey when still building ultimate. - Don't recalculate ultimate on weapon swap or new ultimate setting if automatic ultimate calculation is off. - Fix lua error when destruction staff equipped. - Set ultimate automatically if it is not specified. ultimate, other players will see it on next map tick. - Allow turning off conquest quest sharing after it has been turned on. - Fix LUA error after upgrading from some older versions. - Upgrade LibGPS for Murkmire. - Decrease chatter when someone stealths. - Report forward camp timer information in tooltip for dead characters. - Fix display name character reporting in mouse over. - Display stealthed characters in different font for easy identification of who is stealthed and who isn't. - Report stealthed and combat changes immediately rather than waiting for N seconds in next status tick. - Allow automatic sharing of any PVP keep/resource/player quest via settings menu. - Add mouse-over tooltip information when moving mouse over the window. - Add list of people for which to automatically accept invites to settings menu (same as /pocgaccept). - Make "/pocoff" (or "/poc off" if you prefer) permanent. It will stay turned off over /reloadui or login/logout. This turns off ultimate sharing and automatic quest sharing but will still automatically accept offered quests as per your preference. - Bump API version for Wolfhunter. - Add menu option to always allow acceptance of any Cyrodiil queue. - Make a minor change to attempt to cut down on crosstalk with other addons that use map pings for communication. - YA try at removing duplicate ult notifications. - Fix bug which didn't allow turning quest sharing back on via the menu (/pocquest on still worked). - Make it so that if you turn off quest sharing then nothing automatic happens wrt quests. - Update LibAddonMenu to v26. - Add option to turn off quest sharing. - Deny share requests for Chalman Mine/Keep if you've turned off that feature. - Try harder to display POC screen when entering Cyrodiil when using "only display in AVA" option. - Fix countdown hotkey (apparently no one uses this). - Reinstate method for only sending ult percentages when they change. It's needed to send quest requests. - Consider a player out of range after two minutes rather than one minute. Hopefully will help with lane resorting. - Update LibGPS and LibSocket. - Attempt to fix bug where ultimates are sporadically not communicated. - Fix failure to communicate ultimate data when language is unknown. - Warn when conflicting addons are detected (this behavior can be turned off if desired). - Fix inability to clear secondary ultimate. - Eliminate YA unnecessary screen update/map ping. - Fix strange problem where ultimate seems to fire twice. - Reduce number of screen refreshes, limiting to only when something changes like "in combat" or "ultimate percent changed". - Get non-English clients working on Summerset. - Fix issue with /pocpvp. - Fix memory leak with ultimate animations. - Reduce map ping overhead. - Reduce number of times stuff is redrawn. - Delete remaining legacy Taos Group Ultimate code. - Make visible when sieging. /poccampaign X sets your preferred campaign to X (defaults to Vivec). ESO approximation of wait time. /pocpvp queues you for specified campaign. - Attempt to fix problem with multiple ultimates showing in columns. - Fix YA lua error. - Remove buggy attempt to increase max swimlanes to 8. - Fix ability to set fewer swimlanes if needed. - Decrease ping frequency to 2 seconds to be a little less resource intensive. Changeable with /pocupdate n.
- Increase max swimlanes to 8. - Fix arithmetic error when decoding map pings. - /pochelp only reports on non-debuggng options now. Use /pochelp debug to see everything. - Fix addon not working. - Attempt to fix lua error when primary ultimate has not been selected. - Fix display of @names. - More attempts to minimize memory use. - Potential fix for lua errors. - Emergency fix for swimlane madness. - Add ability to turn off ultimate alerts. - More slight performance tweaks. - Try to minimize bouncing in columns when out of range. - Try to future proof map pings slightly. - Fix condition where old group members show up after reloading. - Be less verbose on leaving group. - Optimize LUA code to avoid potential excess memory use. - The ultimate control will now always be movable. That red background thing will show up briefly when you drag the window to a new location. Type "/pocmovable off" if this behavior is not to your liking. - When someone fires an ultimate it will show up onscreen for everyone as, e.g., "Valandil Tiwele's FREEZE". - You'll be able to specify a second ultimate by selecting the thumbs-up with a "2" on it. That cause that ultimate to show up as a different color in that column. (I'm still tinkering with this so some things may not work right. Most notably - if I put meteor on my bar and then use the ultimate, the on-screen message will say "Valandil's FREEZE" rather than "Valandil's METEOR". - It will be possible to automatically share the Chalman mine and keep quests. 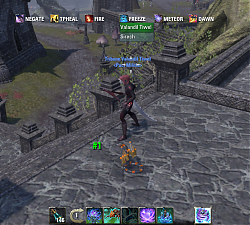 When you turn in your chal quest, you'll get it back almost immediately if anyone else in the group has it. This feature is controlled in the settings window and via the "/pocquest off" command. - The add-on notifies when someone is running a new version. Then you'll know it's time to update. - Overwrite (temporarily?) French translations with English to avoid lua errors. - On second thought, only allow group leader to set countdown key. - Add ability to send a 3 second countdown timer to all players via slash command (/pocn N) or keybinding. - Eliminate need for everyone to be in the same map/zone. - Eliminate misbehaving LibGroupSocket (for now?). - Save group content over /reloadui. - Fix a few bugs related to screen refresh when players go offline and back online. - Added new method for selecting your ultimate: Click on one of the column (swimlane) icons and then click on the thumbs-up to switch your ultimate to that lane. Use icons to select columns rather than words. - Added back ability to use libgroupsocket, currently only available via the command "/pocping false"
- Tinkered more with the number notifier and sound notifier to try to make it actually accurate. - Added ability to display @names rather than character names. - Attempt to fix incorrect #n showing up on screen when it shouldn't. - Hopefully fix rare case where out-of-contact player would incorrectly assume another player's group ultimate. - Temporarily remove detection of out-of-date clients in group. This should stop people from showing up in MIA in yellow. - Fix reported issue of lua error when changing group icon in compact mode. NOTE: This needs testing. Please make sure that you know how to drop back to the previous version before updating. - Avoid spurious errors when going in and out of same zone as other players. - Fix lua errors when moving compact swimlane. - Fix a typo in ultimate name. - Hundreds of lines of code deleted and refactored. - Attempt to make ultimate numbering more consistent so that everyone sees the same ordering. - Move ultimate selection moved to settings menu. - Remember the last ultimate you used on a particular character. - Detect when a player goes out of range and may not be available to drop an ultimate. - Detect when a player is in loading screen (their menu bar will be grey). - Show more compact rows for the standard setting. - Select the number of "swimlanes" available, from 1 to 6. - Detect when a player is in group but is not in range or is not using the add-on. These players show up in a "MIA" column. - Attempt to minimize the amount of screen redrawing happening every second. Should be optimized to only update the screen when something changes. * Hopefully fix confusion with player numbering when group membership changes. This may fix the issue seen where numbers displayed are incorrect. * There is still an issue with numbering disparity between different players after zoning. Numbers should sync eventually after users cycle their ultimates as long as they are in the same map. The small icons are supposed to appear but the large ones are supposed to temporarily disappear. I'll fix that. I can't duplicate this behavior with the latest version. I didn't intentionally fix anything though. Is this still happening when you click on the top of a column with "/pocstyle standard"? Again, what is supposed to happen is that the icons for every ultimate show up on screen so that you can rearrange them. The text is supposed to disappear. If this is still happening then I'd appreciate a screen shot of all of the /poc settings so that I can set things up exactly to see if I can trigger the problem. The same happens with the other morph of the Psijic Ultimate, BTW. blue msg in chat "HERE sent the message" - must be or part of debug? Yes, LibMsgWin-1.0 is not necessary. Meant to mention that in the changelog. I've removed the debugging output. Thanks for the heads up. Last edited by Tiara Ra : 04/17/19 at 12:53 AM. It looks like you have another sharing addon runnning. I wonder if it is interfering. Could you post your addon list here? will show if you're getting map pings (which is how POC communicates information) but it won't give enough information to tell if you're sending/receiving the map pings which should be advancing your ultimate. will turn off this info. Hmm. I don't know what would be causing that. Are they running the latest version? I usually play as a warden and haven't noticed that. If they set their ultimate and crash it will revert to whatever it was before the crash. Does this happen after a /reloadui (or if POC is loaded /rrr)? Btw, when reporting problems like this, if at all possible, please verify that the version you see from /poc is the latest (currently 3.38). Last edited by Tiara Ra : 04/10/19 at 11:43 PM. 4. Ours sorcs and wardens stil have problem with show right ulti after restart game - game (addon) put for them wrong (auto finder ulti - off). The problem is with NOT having PoC installed, and still having these quests spammed by someone who IS running PoC. There's no way to stop it, other than just accepting the quest, or already having a quest for that category. I just had this happen as I loaded into Cyrodiil, have someone trying to share Chal Mine quest and they're not even on that side of the map atm. Quests are shared when someone with POC requests them. They are shared to the whole group because that's how quest sharing works. So, even if you don't have the addon you'll still receive the quest, the same way as if someone in your group shared the quest. Your location in Cyrodil doesn't affect the sharing. If you turn off "Automatically share quests" in /poc options then you will never automatically offer the quest to anyone who requests it. If you change the "Automatically request ... quest" to "-- no ... quest wanted --" you will never ask for a quest - which is now the default. So, if some people in your raid really want the quest then there is no way to differentiate between them and POC users. The only thing you can do is turn off quest sharing entirely. Last edited by Sekkerhund : 04/03/19 at 06:41 PM. The LibMsgWin-1.0 that used to be released with the addon is the same code as the most recent LibMsgWin from esoui. Try reinstalling it and LibStub. This is Piece of Candy trying to tell you that you have a conflicting addon but, as far as I can tell, some other addon has created a window called "POC_Conflicts" already so it can't open a window to report on that. I just tried this with "Group Damage Share" and it did create an error as expected. Donations appreciated but not in any way required.